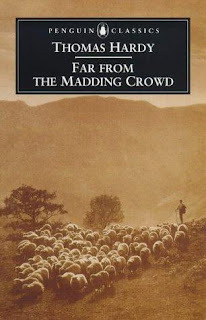 I need to get something off my chest: in the case of Far from the Madding Crowd I watched the (2015) movie before I read the book. (GASP.) Yes, it's true. The reason was though that the movie was available on the plane. (Is that a good excuse?) Redemption was offered when one of the ladies in my in town bookclub chose it for our upcoming read. I was delighted to rectify the situation because while I enjoyed the movie, (with a few exceptions), I could tell from the storyline that the book was going to be far and away better. On this point, I was definitely right. Far from the Madding Crowd by Thomas Hardy is indeed an interesting and good story. If you are unfamiliar with the tale, it revolves around the character of Bathsheba Everdene who is a headstrong female with a desire to conquer the world. I must say that I liked her immediately. Although the book is about Bathsheba, we really get to know who she is and we watch her mature through her relationship with three men, each a stand out character in their own right. The book opens with an introduction to one Gabriel Oak, a beginning farmer who meets Bathsheba and instantly falls in love with her. He asks her to marry him and she flatly refuses, feeling as if he is beneath her. Not too much time passes before Bathsheba herself inherits a farm and she can sustain and support herself. The fortunes of Oak and Everdene are reversed but their paths still must cross. Far from the Madding Crowd is a story of fiery, headstrong passion and a deepening maturity which comes of age and life experience. Not everything is as Bathsheba would expect in life but, ultimately, everything that the reader desires to have happen, does. Admittedly, the story starts slow so if you are just getting into it, push through! Hardy's vocabulary can seem a little daunting and he loves describing the landscape more than I'd really care to hear about it. I found myself skimming his more descriptive passages but when he focused on the people and relationships he had me hook, line and sinker. The history of the book is quite interesting if you care to peek into it a bit. I've never read anything by Thomas Hardy before but am made to understand that Far from the Madding Crowd is his fourth novel and most successful. It was originally published anonymously in a monthly serial magazine. (I can't fathom how original readers must have felt waiting for the conclusion of the novel as it slowly unfolded.) Although it was published over some period of time, it was well received. Many readers attributed the book to George Elliot but Hardy eventually stood up and took the credit. He revised the story and cleaned it up some for the 1895 edition of the book and then revised further for the 1901 version. I can't quite tell if the story we are able to read now was fully put together by Hardy or if he had some help with editors over the past century. At any rate, Hardy is the author. If you're even remotely interested in reading this story, I would heartily recommend it as a haunting, desperate, romantic, satisfying, brutal tale. The 2015 edition of the movie is one I would also recommend, with the caveat being that there are two scenes, (which I knew then and can confirm now are not in the book), which you might wish to fast forward through. Apparently movie producers think we won't consent to sit through anything that doesn't promise a few racy scenes. (How arrogant that assumption is!) Nevertheless, I enjoyed the movie and think that it definitely contains the flavor of the book. Still, I'm even more happy to say that I've read the book which grants me pardon for having seen the movie in the first place, correct? Right!? Watch the movie. Enjoy it. But read the book! It is a far more intricate, beautiful and fascinating story than what was portrayed on screen -- just as every book lover might properly expect! So naughty to have watched the movie first. :D I have become interested in reading the book, and might try to do so sometime this year. Thanks for sharing your thoughts! By the way -- I hope you'll be hosting your book club on the blog again! I do so enjoy the monthly reads, as I always get to find some good literature from it. This is a title I have seen but never checked into, so I appreciate hearing more about it. Sometimes with long classics it actually does help to have seen a film version first - it's easy to get a little lost in the details of the book, so knowing where it's going and have the skeleton of it, at least, in the film makes the fleshing-out of the book more enjoyable. I've watched the movie and have not read the book yet. Your post has reminded me that I did want to add it to me "to read" list for the future. Great review! I want to read this book since my littlest sister was reading it in 2013. I guess it's time. I was so excited to see this review up by you. I've been humming and hawwing whether to purchase this book from BookOutlet. I may just to now! book is short chapters and plenty of them.Such reading was a forerunner of the Soaps of radio and TV. I have read Hardy's Tess of the D'Urbervilles and The Mayor of Casterbridge and enjoyed them both. I think I would enjoy Far From the Madding Crowd as well; thanks for your review. Thanks for the tip on Tess of the D'Urbervilles. I've not read that one and will keep it in mind as a "highly recommended."